In These Schools Belong to You and Me, MacArthur award–winning educator, reformer, and author Deborah Meier draws on her fifty-plus years of experience to argue that the purpose of universal education is to provide young people with an “apprenticeship for citizenship in a democracy.” Through an intergenerational exchange with her former colleague and fellow educator Emily Gasoi, the coauthors analyze the last several decades of education reform, challenging narrow profit-driven conceptions of school success. Reflecting on the trajectory of education and social policies that are leading our country further from rule “of, for, and by the people,” the authors apply their extensive knowledge and years of research to address the question of how public education must change in order to counter the erosion of democratic spirit and practice in schools and in the nation as a whole. 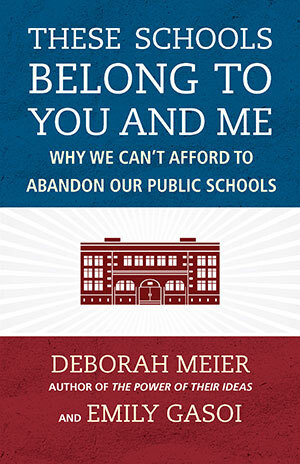 Meier and Gasoi candidly reflect on the successes, missteps, and challenges they experienced working in democratically governed schools, demonstrating that it is possible to provide an enriched education to all students, not just the privileged few. Arguing that public education and democracy are inextricably bound, and pushing against the tide of privatization, These Schools Belong to You and Me is a rousing call to both save and improve public schools to ensure that all students are empowered to help shape our future democracy. 1 The Problem and Promise of Public Education: What’s Worth Fighting For? 7 What Happens to Democratic Education Deferred?